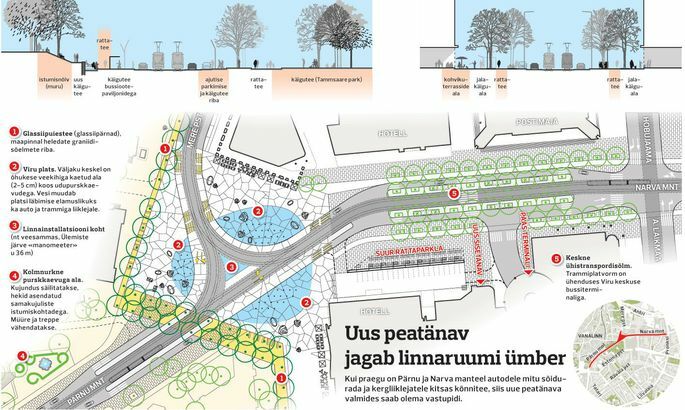 Emerging as winner of Tallinn Main Street design contest, «Kevad linnas» (Spring in the City) is focussed at creating a humans based space. According to head of the jury and Tallinn deputy mayor Taavi Aas, the turning of Tallinn city centre into a place more people-friendly begun a couple of years ago - as Harju Street was given wholly over to pedestrians. At the moment, the same is applied to Viru St as renovations of Tammsaare Park are soon to get underway as well. The work which now won the contest will merge the park and main street into one common city space, said the vice mayor. Within the project, the Port of Tallinn will be connected with city centre and Old Town as well. According to Mr Aas, the new main street might get ready by mid-2019. With Estonia assuming the rotating EU presidency in 2018, they are unwilling to dig up the entire city centre during that, but will do that as soon as the presidency is over. «As the 2019 Song Celebration procession walks along that street, it might as well be altogether other than now,» said Mr Aas.